Editor’s note from Brian: You might want to start out with one or two minutes rather than 4 minutes and have your players build up to 4 minutes. Especially for younger teams. One of my favorite drills is The Inferno. It immediately raises the intensity level or shows the lack of it. Players begin on the elbows and blocks. This drill is for 8 minutes. The team’s roles will switch at the 4 minute mark. There are no substitutions for the 8 involved. When the ball is at the top, the offense down screens. When the ball is on the wing, players screen across. Each catch = 1 pt for elbow catch, 2pts for catch on the block. Keep track and at the end of 8 minutes losing team has a reminder drill. Each catch = live four on four. Offense gets whatever shot they score, Defense gets 2 for a stop, 3 for a charge, etc.. Offensive Players Start on on Elbows and Blocks. 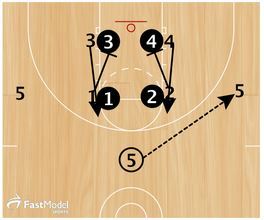 This is an 8 minute drill: Switch Offense and Defense at 4 minute mark. No Substitutions! You decide how to make it competitive. You can go live on the catch. Stop on the catch-keep score for catches or defense 5 pushups for every catch. When the Ball is up top, Offensive Players down screen. If passer can’t get a pass to either elbow, he passes the ball to the next passer to continue the drill. At the 4 minute mark, switch sides. 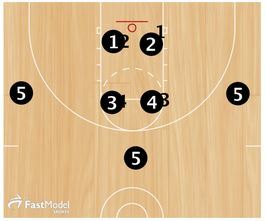 is the 4 on 4 play only confined to the key area, or is it 4 on 4 half court? Hi Jason, you could do the drill if you are a switching team, but IMO that would change the focus of the drill. I think the best way to determine if it is something that will help your team is to try it in practice and run it the way you want to run it. You will get a better feel if it is something that helps your players improve or not. I think it is good to experiment a couple of times a week with new ideas for 5 or 10 minutes each time. 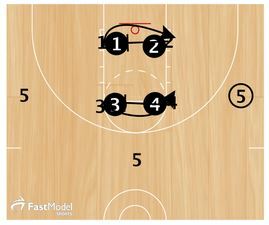 This drill is confined to the key area, but you could experiment with it on the half court and see how it works for you.